A reed switch is a magnetically operated switch – moving a magnet near to the switch will cause it to close (if it has normally open contacts). A picture of a reed switch is shown below. The switch contacts of a reed switch are sealed in an airtight glass tube. This video demonstrates the operation of a reed switch. Reed switches are commonly found in alarm sensors that detect when a door or window is opened. 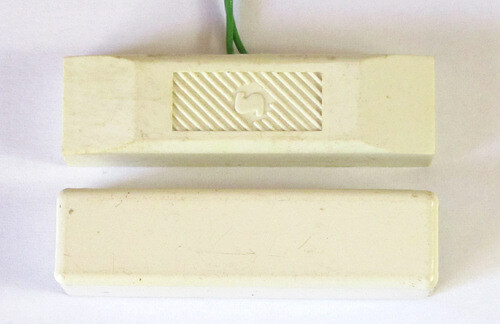 An image of a reed switch used in an alarm system is shown below. The reed switch alarm sensor is simply a reed switch packaged in a plastic case with an accompanying magnet packaged in a plastic case. 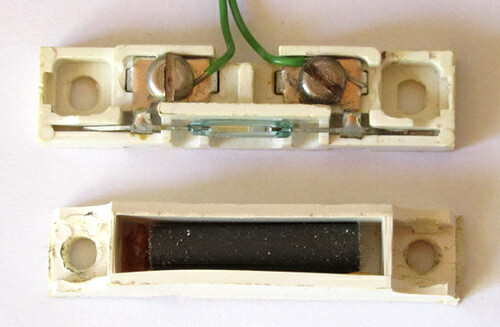 The inside of the reed switch alarm sensor can be seen below.